If you prefer written instruction instead, below is the tutorial. Hidden rows and columns can be quite irritating at times. Especially if someone else has hidden these and you forget to unhide it (or even worse, you don’t know how to unhide these). 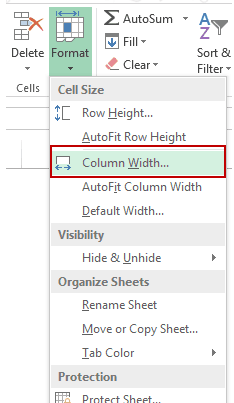 While I can’t do anything about the first issue, I can show you how to unhide columns in Excel (the same techniques can also be used to unhide rows). It may happen that one of the methods of unhiding columns/rows may not work for you. In that case, it is good to know the alternatives that can work. Let’s go through each for these scenarios and see how to unhide the columns. If you have a worksheet that has multiple hidden columns, you don’t need to go hunt each one and bring it to light. You can do that all in one go. And there are multiple ways to do this. Click on the small triangle at the top left of the worksheet area. This will select all the cells in the worksheet. Right-click anywhere in the worksheet area. No matter where that pesky column is hidden, this will unhide it. Note: You can also use the keyboard shortcut Control A A (hold the control key and hit the A key twice) to select all the cells in the worksheet. If you need to do this often, you can also use VBA to get this done. The below code will unhide column in the worksheet. You need to place this code in the VB Editor (in a module). If you want to learn how to do this with VBA, read a detailed guide on how to run a macro in Excel. Note: To save time, you can save this macro in the Personal Macro Workbook and add it to the quick access toolbar. This will allow you to unhide all columns with a single click. If you’re more comfortable using keyboard shortcuts, there is a way to unhide all columns with a few keystrokes. Select any cell in the worksheet. If you can get hang of this keyboard shortcut, it could be a lot faster to unhide columns. 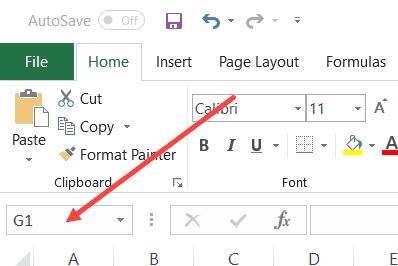 Note: The reason you need to press A twice when holding the control key is that sometimes when you press Control A, it only selects the used range in Excel (or the area that has the data) and you need to press the A again to select the entire worksheet. Another keyword shortcut that works for some and not for others is Control 0 (from a numeric keypad) or Control Shift 0 from a non-numeric keypad. It used to work for me earlier but doesn’t work anymore. Here is some discussion on why it may happen. I suggest you use the longer (ALT HOUL) shortcut that works every time. There are multiple ways you can quickly unhide columns in between selected columns. The methods shown here are useful when you want to unhide a specific column(s). Let’s go through these one-by-one (and you can choose to use that you find the best). Select the columns that contain the hidden columns in between. For example, if you are trying to unhide column C, then select column B and D.
This will instantly unhide the columns. One quick and easy way to unhide a column is to use the mouse. Hover your mouse in between the columns alphabets that have the hidden column(s). For example, if Column C is hidden, then hover the mouse between Column B and D (at the top of the worksheet). You will see a double line icon with arrows pointing on left and right. Hold the left key of the mouse and drag it to the right. It will make the hidden column appear. 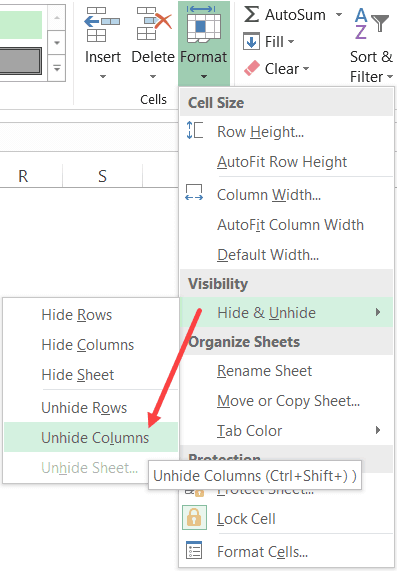 Under the home tab in the ribbon, there are options to hide and unhide columns in Excel. Select the columns between which there are hidden columns. In the Cells group, click on Format. Hover the cursor on Hide & Unhide option. Another way of accessing this option is by selecting the columns and right clicking using the mouse. In the menu that appears, select the unhide option. Below is the code that you can use to unhide columns in between the selected columns. There is a possibility that none of these methods work when you try to unhide column in Excel. It happens when you change the Column Width to 0. In that case, even if you unhide the column, it’s width still remains 0, and hence you can’t see it or select it. In the name box, type any cell address in that column. For example, if it is column C, type C1. Although the column is not visible, the cursor would go in between B1 and D1 (indicating that C1 has been selected). In the Cells group, click the Format option. Click on the ‘Column Width option. It will open the Column Width dialogue box. Enter a column width value to make the column visible. 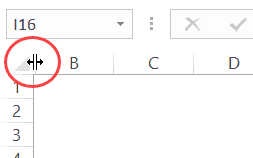 This is by far the most reliable way to unhide columns in Excel. If everything fails, just change the column width. Unhiding the first column can be a little bit tricky. You can use many of the methods covered above, with a little bit of extra work. Let me show you a few ways. Even when the first column is hidden, Excel allows you to select it and drag it to make it visible. To do this, hover the cursor on the left edge of column B (or whatever is the leftmost visible column). The cursor would change into a double arrow pointer as shown below. Hold the left mouse button and drag the cursor to the right. You will see that it unhides the hidden column. But how do you go to any cell in the column that’s hidden? You use the Name Box (it’s left to the formula bar). Enter A1 in the Name Box. It will instantly take you to the A1 cell. Since the first column is hidden, you won’t be able to see it, but be assured that it’s selected (you’ll still see a thin line just left of B1). Hover the cursor on the ‘Hide & Unhide’ option. Again! How do you select it when it’s hidden? Well, there are many different ways to skin the cat. And this is just another method in my kitty (this is the last cat sounding reference I promise). When you select the leftmost visible cell and drag the cursor to the left (where there are row numbers), you end up selecting all the hidden columns (even when you don’t see it). 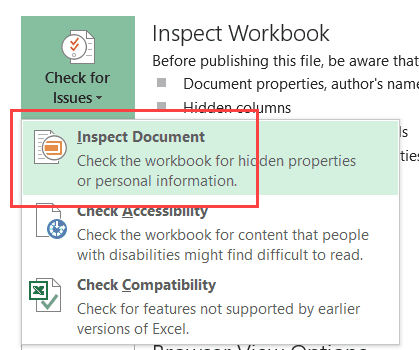 Excel has an ‘Inspect Document’ feature that is meant to quickly scan the workbook and give you some details about it. And one of the things that you can do that ‘Inspect Document’ is to quickly check how many hidden columns or hidden rows are there in the workbook. This might be useful when you get the workbook from someone and want to quickly inspect it. In the Info options, click on the ‘Check for Issues’ button (it’s next to the Inspect Workbook text). 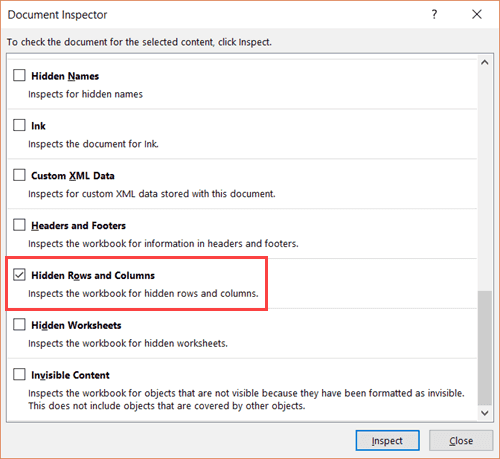 In the Document Inspector, make sure Hidden Rows and Columns option is checked. This will show you the total number of hidden rows and columns. It also gives you the option to delete all these hidden rows/columns. This can be the case if there is extra data that has been hidden and is not needed. Instead of finding hidden rows and columns, you can quickly delete these from this option. 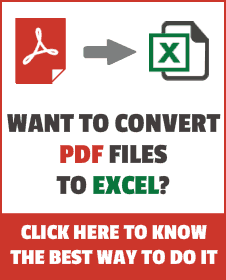 How to Hide a Worksheet in Excel.